A power inverter, once installed, lets you plug electronic devices such as mobile phones and laptops inside your car. It is really useful when a device starts to run low on battery during road trips and other long-distance travels with your vehicle. We have chosen BESTEK 300W Car Power Inverter as the best power inverter for cars this year. Find out why it is our top product! BESTEK 300W Car Power Inverter gives 700 watts of instantaneous power and 300 watts of nonstop DC to AC power. Four devices can be plugged into this product, thanks to two USB ports and two AC outlets. When it comes to charging, the 110-volt AC outlets quickly charge all devices, even bigger ones like tablets and laptops. Do not worry about overcharging, overloads, short circuits, and overheating; this product has a built-in 40-amp fuse for safe charging and an integrated cooling fan for heat control. This power inverter will definitely not be distracting inside your car because it is very lightweight and compact. In fact, it is only as big as an iPhone. Despite the extremely small size, its housing is made of tough metal to protect it from bumps and drops. It is compatible with most cars since it has a 24-inch cigarette lighter plug. FOVAL 150W Car Power Inverter is perfect for kids, readers, gamers, mothers and people with certain health conditions while they are on the road. Its AC outlets can charge portable DVD players, iPads, e-readers, game consoles, breast pumps, CPAP machines, nebulizers, and lights. 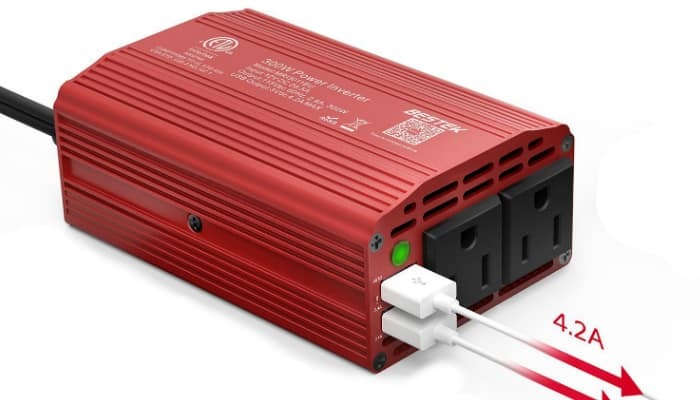 This power inverter for cars takes it up a notch when it comes to size. It is unbelievably small, approximately just the same size as a credit card. Because of this, it is too easy to store and effective in saving space. Like our top product, this one is also small but terrible. It is covered with a super-durable aluminum shell for protection. 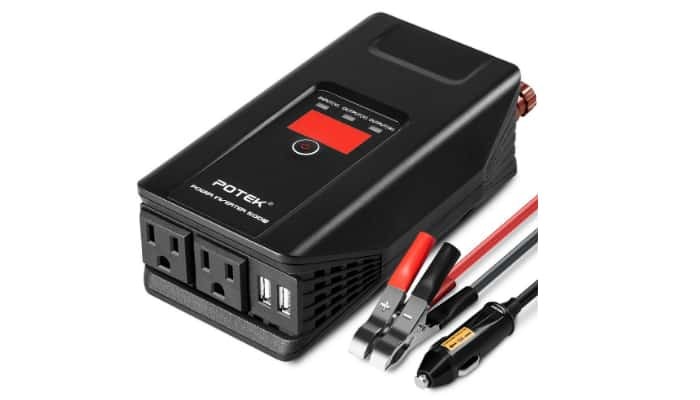 POTEK 500W Car Power Inverter has a unique design. Amazingly, it has a digital display that shows the current status and lights up when you read it, perfect for night travel. Regarding its power, the peak is 1,000 watts. This power inverter also has a cooling fan. With the right output power, it can work so quietly. Lastly, it comes with special clips so you can connect it straight to the car battery when you are camping. It can definitely be your best friend during emergencies and out-of-town vacations. 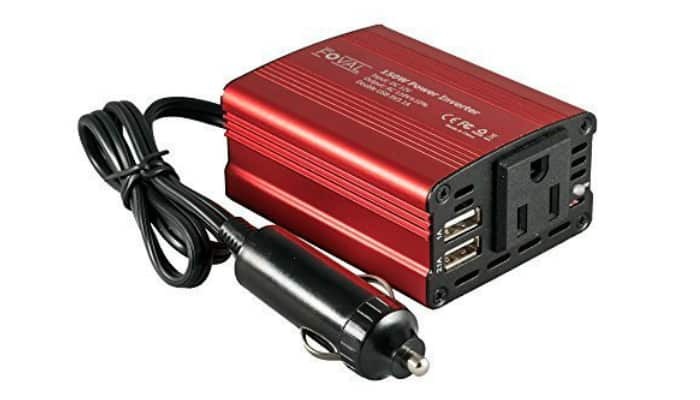 Enkey 150W Car Power Inverter aims to give you an easier reading of status. It has an LED indicator. Green means smooth operation while red signifies failure. Its utility cord is long enough for everyone’s convenience. It measures 16 inches in length, making sure that passengers at the back can also use it. Before anything else, think about power first. After all, the main purpose of a car power inverter is to convert direct current (DC) to alternating current (AC). DC refers to power with a low voltage which can generate from independent batteries you may find in boats, trucks, and of course – cars. On the other hand, AC is the kind of power you utilize at home so you can use your gadgets, and appliances such as refrigerator, coffee maker, laptop, and television. Now, the car inverter’s power depends on the car power outlet’s fuse size. For instance, a fuse with 10 amps and a lighter socket with 12 volts can successfully power 120 watts or one amp of AC with 120 volts. Another example is a socket with 15 amps that can power 150 to 180 watts or 1.5 amps of AC with 120 volts. For bigger figures, 20 amps can power 200 to 225 watts or two amps. In order to have a concrete basis for power while you are browsing the store, read the car owner’s manual for the size of your lighter socket’s fuse. The common figure is 15 amps. Meanwhile, bigger vehicles like trucks and SUVs can have 20 amps. For a clearer perspective on the power of a 200-watt inverter, it can operate a 13-inch TV. Immense power from a car power inverter is useless if it only has one outlet. Let’s face it; you usually bring several electronic devices on the road. You even have your family and friends to think about. The common maximum for car power inverters when it comes to the number of outlets is four. Specifically, the set is usually two AC outlets and two USB ports. There are two reasons for that: size and power. Inverters are typically small, very similar to the size of portable power banks and external hard drives. With four AC outlets, there is no more space for USB ports. That is not a good thing since most gadgets rely on the latter. On the other hand, AC outlets release more power than USB ports. Four AC outlets are too much for such a small supplier of power with definite limitations. Prioritize buying a car power inverter with a fast charging feature. Sometimes, overheating stems from long hours of charging. This is also useful when four outlets are not enough for you and your passengers. We do not want one bored passenger in long road trips, especially a child. Another way to avoid overheating aside from avoiding several hours of charging is choosing a car power inverter with an excellent fuse and a strong cooling fan. This kind of inverter does not only focus on prevention of overheating. It also aims to stop short circuits, overloads and overcharging. Moving vehicles are too fragile for any kind of accident, and we do not want that to happen from the car’s interior. Make sure that the car power inverter has a tough housing or shell. An ideal material for that is metal especially aluminum, which is probably the most popular kind for inverters. Cars move harshly over road bumps and rough surfaces, leading to the possibility of your inverter tumbling around. With a strong shell, there is no need to worry about the inverter being broken in case it bumps onto a hard surface. 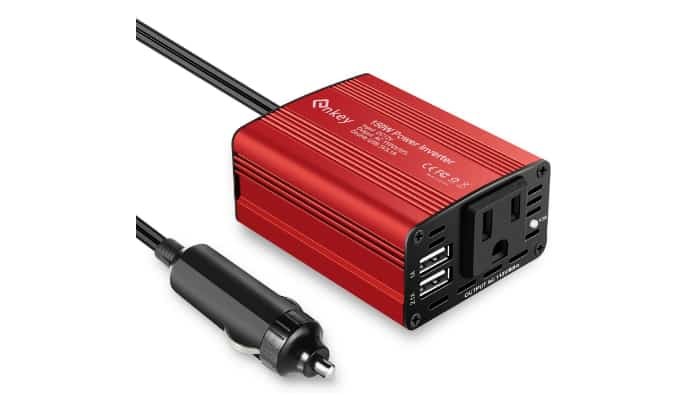 BESTEK 300W Car Power Inverter is our top product because it aces everything we are looking for in an inverter for vehicles: a practical amount of power, four outlets complete for plugs and USB cords, fast and safe charging, portability, and durability. In general, the best power inverter for cars should have enough power as well as multiple and versatile outlets. It must also charge devices fast while maintaining control for safety purposes. Lastly, it is a product meant for long-term use, so invest on something that will last for a really long time because of its durable material.